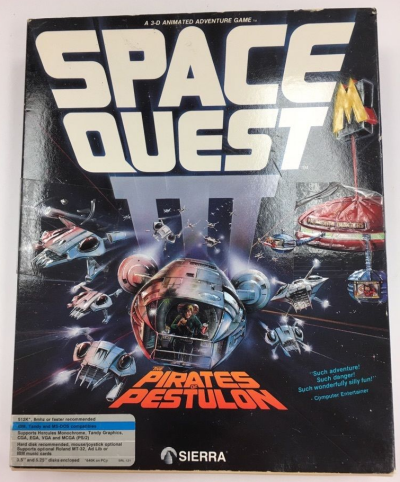 I love Space Quest III: The Pirates of Pestulon. I just do. I love its many mad deaths, the silly Sierra meta-jokes, the excellent EGA graphics, the playful parser, the clever writing, the sci-fi setting, even many of the puzzles. Also, I do love the box it came in, and I do thus suppose many would be interested in this Space Quest III (MS-DOS) eBay auction. It's for the 5.25" disk MS-DOS version of the game, and it comes with manual, Sierra catalog, the disks, and three leaflets.